Improved design of the high-speed electric handpiece. This article is sponsored content brought to you by Dentsply Sirona. Repetitive Strain Injury (RSI) or tendinitis is a real concern for dental professionals. Simply repeating a motion frequently on tight tissues is all it takes. If that repetition is enough that the rate of damage exceeds your body’s natural rate of repair, RSI develops. Symptoms including sharp pain, dull ache, tingling and numbness can appear over time. Initially occurring only while performing the aggravating activity, with no rest or treatment, constant pain will result. The hands, wrists and forearms are particularly susceptible to RSI injury and the repetitive actions of dental work straining the same muscles puts clinicians at risk. Since most dental procedures involve a handpiece, improving the ergonomics of handpieces can reduce the risks over time. Comfort, grip, weight, size and performance are all considerations for optimal handpiece features. 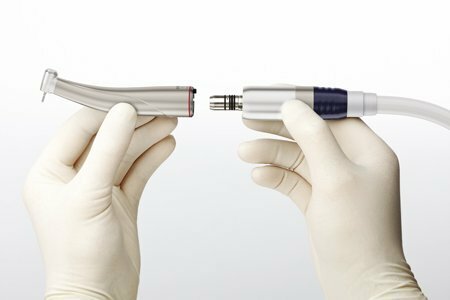 Over the past few years, innovation designed for the clinician has brought major improvements in handpiece ergonomics. The high-speed turbine on an average airline is lightweight. With an optimal weight range for a high-speed handpiece being around 56 grams or under, slow-speed handpieces can be considerably heavier. Adding to the overall weight is the electric motor and hose that creates ‘drag’ at the back end and puts strain on the hand and wrist. The good news is that new smaller, brushless motors are now available. When used in conjunction with smaller handpieces, the reduction in weight is considerable. Modern electric hoses have also reduced in weight and have improved flexibility. Updating the electric motor and hose on an older dental unit can improve the overall ergonomics of everyday use. By widening the handpiece’s sleeve and smoothing out the sharp angle into a smooth curve, the dentist can comfortably hold the handpiece in a variety of positions. The wider more curved sleeve reduces the ‘pinch grip’ that is well known as a risk for RSI. Additionally, the texture of the handpiece should be non-slip, even when wet and in a gloved hand, though grooves and etched grips pose a problem for infection control and instrument cleaning. Materials such as non-slip titanium offer a good solution for this purpose. Titanium is also extremely lightweight and has the added benefit of having optimal bio-compatibility and a very low incidence of allergic reaction or metal sensitivity. Dentsply Sirona S-Line handpieces are ideal for cavity and crown preparations. Where a larger handpiece may be suitable for some, a smaller female, for example, will have a much different hand size to weight ratio. Along with the introduction of the smaller lighter brushless electric motors, dentists can now choose a shorter, lighter contra angle that is available in speed ratios to suit most common applications. By reducing the length of the handpiece, the weight of the motor and hose can be better supported in smaller hands. The improved ergonomics reduces the ‘drag effect’ strain on the wrist and forearm with repeated everyday use. 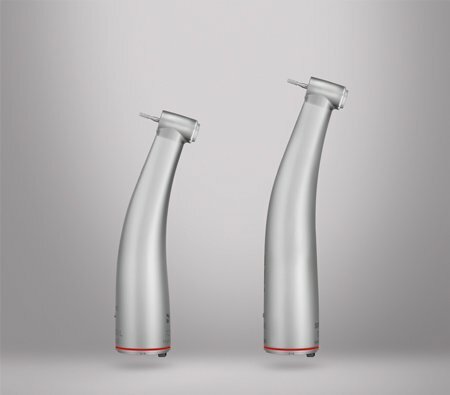 Improved design of high-speed handpieces has improved output over the past few years without sacrificing the size of the head and visibility. Changing out older handpieces to high-speeds with a power output of 23watts or above can make a world of difference to everyday fatigue by minimising time. For constant power and reliable torque, the speed increasing contra-angle handpiece can’t be beaten. The new smaller, lighter and quieter generation contra-angles, such as the Dentsply Sirona S-Line (1:5), are ideal for cavity and crown preparations. The S-Line handpieces remain ideally balanced, allowing the dentist to work without strain or fatigue, even during longer treatments.